Playwright and actor Sam Shepard died just a few weeks ago, leaving us with over 40 plays to remember him by. It's just been in the past few years that I've become familiar with his work, and have grown to love his dark and twisted take on the world. 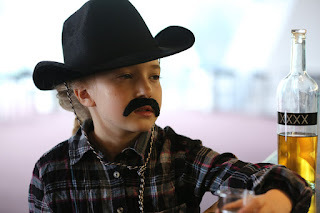 His plays are like modern day Westerns, depressing and hopeless but with a kind of gritty beauty. Dark and Stormy Productions was already in rehearsals for Fool for Love when Shepard passed, giving everyone involved a greater motivation and the play an extra poignancy. The result is a fitting tribute to him, an intense and intimate exploration of love, family, and their devastating effects. In 1997, British playwright David Hare (whose work was recently seen in the Twin Cities via Park Square Theatre's production of Amy's View) traveled to Israel and Palestine to do research for a play about British involvement in the area. What he came away with was a one-man play in which he, the playwright, tells stories from his journey there. 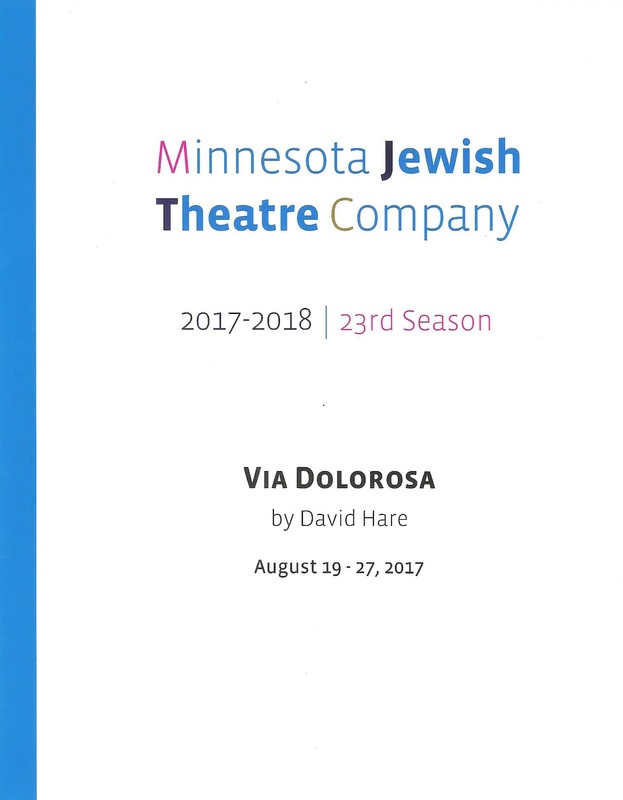 Minnesota Jewish Theatre Company is presenting Via Dolorosa to begin their 23rd season, and wow, is it fascinating. I realized just how little I know about the subject, and felt like I should have been taking notes for this engaging lecture. Vaguely familiar phrases like Six-Day War and Oslo Peace Accord sent me scurrying to Wikipedia this morning for details, but it would take weeks, months, years of study to understand all the complexities and centuries of history. This play doesn't attempt to spell everything out, but rather give one man's impression of the land he experienced and the people he met. Well friends, the Minnesota Fringe Festival has come and gone once again. As always, it was a crazy, exhausting, exhilarating whirlwind of theater in which I saw 49 shows in 11 days. By all accounts it was a successful festival, with over 46,000 attendees seeing 870 performances of 167 shows (see all the numbers and lists of top-selling shows here). There were many shows that I loved, and I'm sure many great shows that I missed. Most of all I appreciate the variety and diversity of the art that is showcased at the Fringe, much of which I don't have (or take) opportunities to see throughout the year. You can read all of my Fringe mini-reviews here, and below is a few of my favorites (in alphabetical order). See you next year Fringers, and be sure to follow Cherry and Spoon throughout the year for other #TCTheater opportunities. One of my favorite summer #TCTheater traditions is Mixed Precipitation's annual picnic operetta, in which one can enjoy classic opera, pop songs, the great outdoors, and delicious food. For their ninth summer operetta (the fourth I've attended), Mixed Precipitation has chosen Austrian composer Joseph Haydn's Philemon and Baucis, a piece so rare it doesn't even have a Wikipedia page. Written and directed by Scotty Reynolds, this timely treatise on a Planet in Peril is a delightful mash-up of beautiful German-language opera and the songs of Queen, with five delicious courses of small bites passed throughout the 70-minute show. Playing at parks and gardens throughout the Twin Cities and beyond, it's a unique opportunity to enjoy all that late summer in Minnesota has to offer (click here to find a location near you). Frine Festival 2017: "Live From New York, He's A Prom Date!" Title: Live From New York, He's A Prom Date! 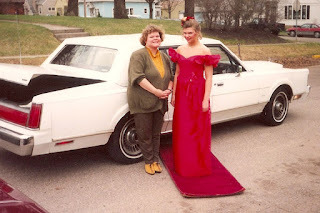 Summary: #TCTheater artist Jen Maren reveals a true story from her past, when her mom put her on the Sally Jessy Rafael show to get a prom date. Highlights: This was a perfect end to my 2017 Minnesota Fringe Festival. I laughed and winced for an hour, and ended it with tears in my eyes. In what is really a love letter to her mom who "loves her recklessly," Jen tells her story with great drama and flair. 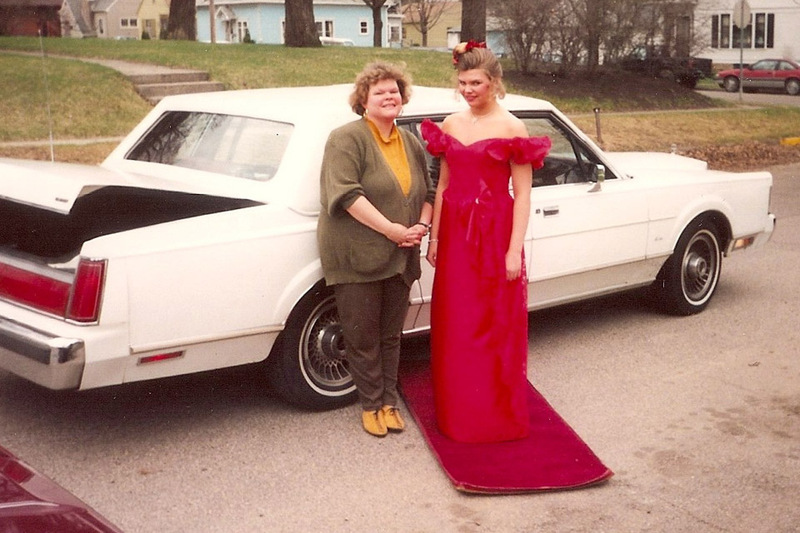 Her mom just wanted her to be happy, so in 1992 she responded to a plea from Sally for girls who didn't have a date to prom. Jen (a budding performer who thought this might be her big break) and her mom flew to NYC, signed a contract, and were told what to say, how to act, and what to wear. Photos and clips from the show are displayed on a video screen, as Jen writhes in horror in a robe eating M&Ms and drinking wine from the bottle. She doesn't talk about the inherent misogyny, strict gender roles, and heteronormativity of the prom itself (no I'm not bitter that I never went to prom, it's true, prom is horrible! ), that could be an entire show unto itself. Rather this show is a memoir in story and song of what it's like to be a young person growing up in this world, and how, if you're lucky, your parents do what they think will make your life better and happier, even if it does the exact opposite. 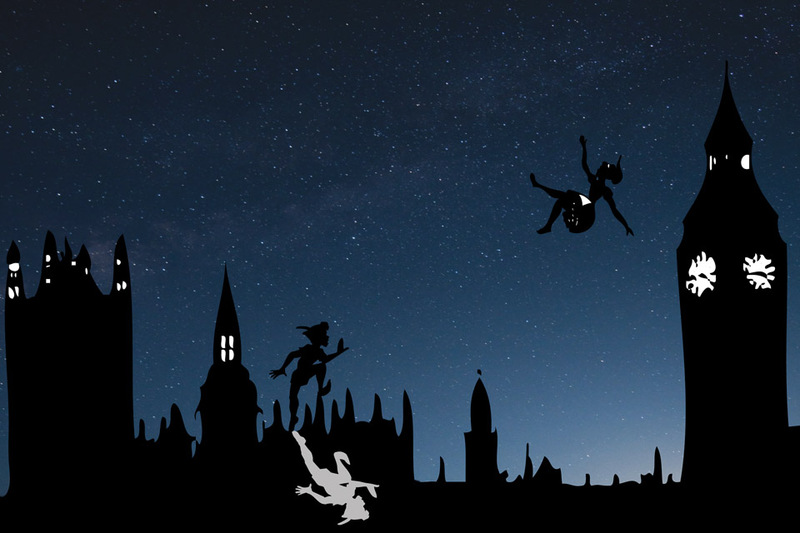 Fringe Festival 2017: "Swords & Sorcery: The Improvised Fantasy Campaign"
Summary: An improvised journey into a fantasy world of knights, dragons, and demons. Highlights: I've never played it, but I'm pretty sure watching this show is like watching a bunch of guys play Dungeons and Dragons while acting out everything. In the show, the "Dungeon Master" Allen Voigt calls out the action and rolls a 20-sided dice to determine the strength of the blows, as the ensemble (Joe Rapp, Lucas Vonasek, MJ Marsh, Tyler Michaels, and Tyler Mills) fight their way through the fantasy world, going on quests and defending themselves against monsters. It's all pretty silly, but great fun to watch. The performers are the most earnest knights and monsters you've ever seen, especially when they fail. 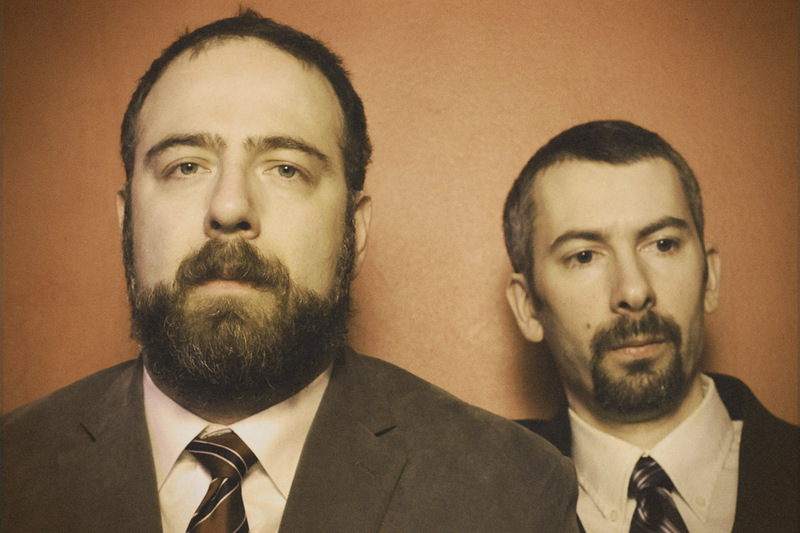 Bearded Men Improv performs regularly at HUGE Theater, and will be doing a Wild West show in the fall. 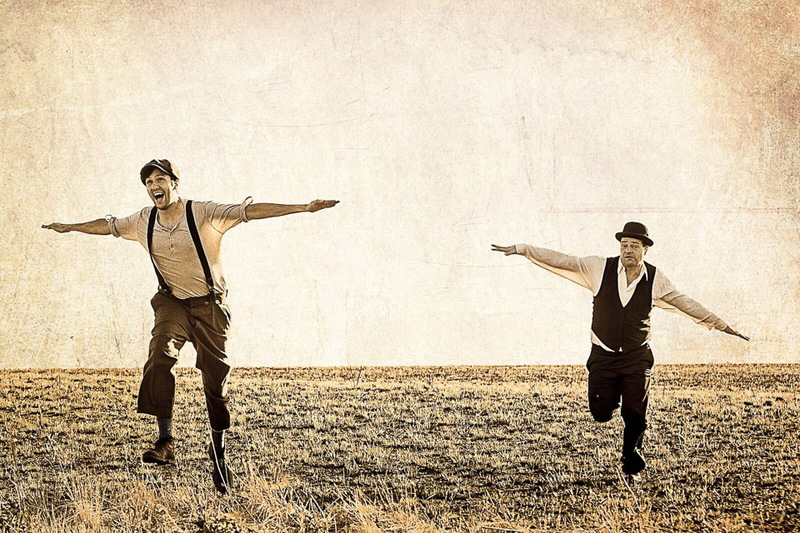 Fringe Festival 2017: "KnoW WesT"
Summary: A real-life family of three tells stories from the Wild West in an innovative way incorporating a capella music. 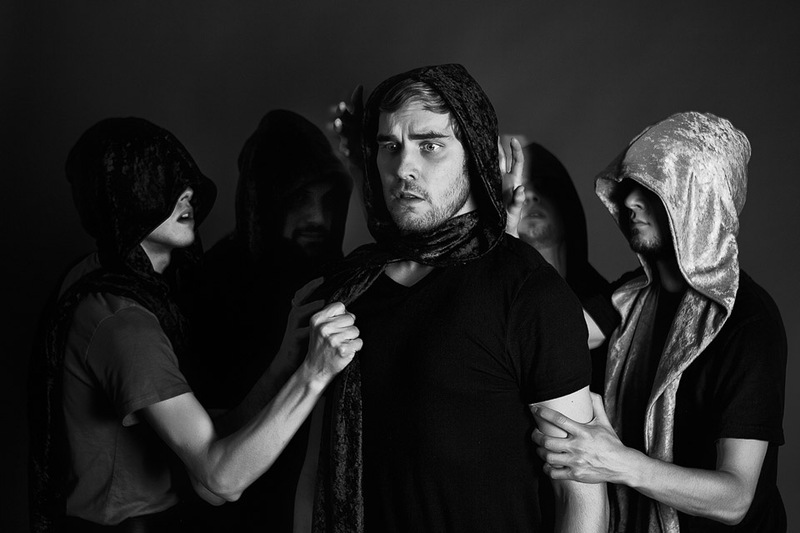 Highlights: I loved Christian Gaylord's 2015 Fringe show Brother Ulysses, created and performed with his brother Andrew, so I was all in for this new creation. KnoW WesT, like Brother Ulysses, is an indescribable mix of history, music, and literature. Christian, his daughter Adrienne, and his girlfriend Karen Howard tell several stories and portray several characters, some true historical figures and some made up (and they're kind enough to tell us which is which). The start with Cormac McCarthey's novel The Crossing, and then wander off into stories and people I can't even begin to remember (I should have been taking notes for later research). It's odd and perplexing and intriguing and delightful, and the trio sings beautiful harmonies on songs traditional and new (including one lovely Civil Wars duet). Fringe Festival 2017: "Couple Fight 3: Weddings!" Title: Couple Fight 3: Weddings! 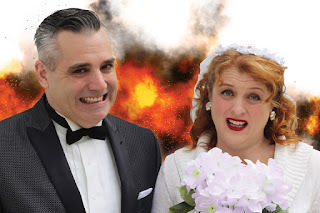 Summary: The third is a series of shows in which some of the Twin Cities' funniest people reenact a fight with a loved one, this time around the subject of weddings. Highlights: I hope the Weggel-Reeds continue to do this show every year. Because nothing is funnier than watching funny people fight with someone they love about something ridiculous. In this hilarious installment, married couples reenact a fight before, during, or after their wedding. Andy Rocco Kraft and Rachael Davies fight about food sampling for the reception caterer. Laura Zabel and Levin Weinhagen fight about the wedding playlist. Nicholas Leeman and Colleen Somerville Leeman fight about getting the wedding invitations done on time. Rita Boersma and Justin Hartke (played by Richie McLarn) fight about her Pinterest project gone wrong. John and Lacey Zeiler fight about the decision to get married at all. And in the one non-couple fight, Heather Meyer explains to her friend Jim Robinson, who is constantly trying to set her up, that she's just fine on her own. I'm sure these fights were traumatic at the moment, but it's the kind of thing you look back on and laugh. And fortunately they do it in front of an audience so we can all laugh with them, and get a little peek into some of our #TCTheater faves' lives and relationships. Fringe Festival 2017: "A Pickle"
Summary: The true story of a woman who petitions the Minnesota State Fair to add a category for Kosher salt brine pickles. Highlights: Sometimes a pickle is more than just a pickle. Sometimes it's a symbol of one's cultural heritage, a symbol of inclusion. 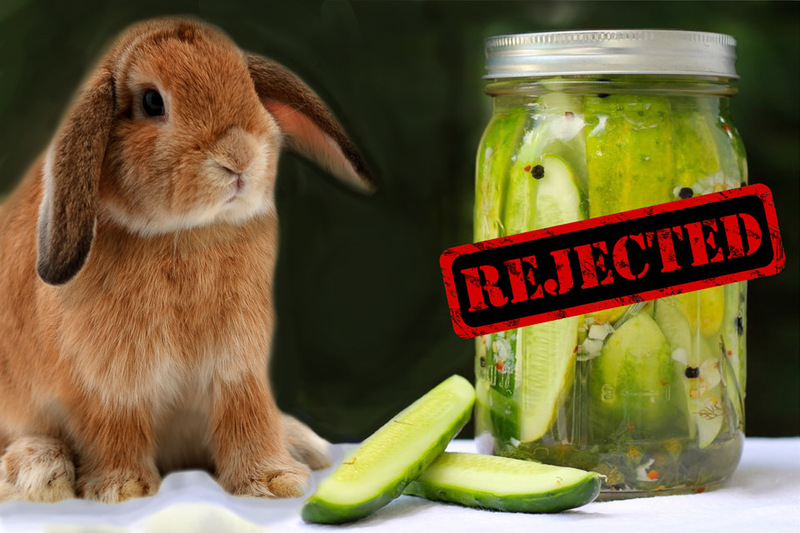 Such is the true story of Doris Rubenstein's pickles. In a nearly perfect hour of theater, playwright Deborah Yarchun has written the story as an engaging one-woman show with direct address to the audience, bouncing back and forth between "the pickle story" and other significant moments in Doris' life. She describes herself as possessing a series of jars that hold the important things in her life - baking, her upbringing, social justice, and of course, pickles. When Doris entered her pickles in the "other" category at the State Fair, the judges disqualified them because they didn't understand the traditional Kosher salt brine pickles, because they're different than the pickles they usually see. Which is when pickles become a symbol for a whole lot more, and Doris becomes a bit of a local hero. This is a great story, well written, and personified brilliantly by Angela Timberman, so personable and funny and real. It's no wonder this show sold out all (or nearly all) of its performances and won the encore slot. "It's chutzpah that puts the cherry on the spoon." Fringe Festival 2017: "MANIFESTO: An American Play"
Summary: A sobering look at gun violence. 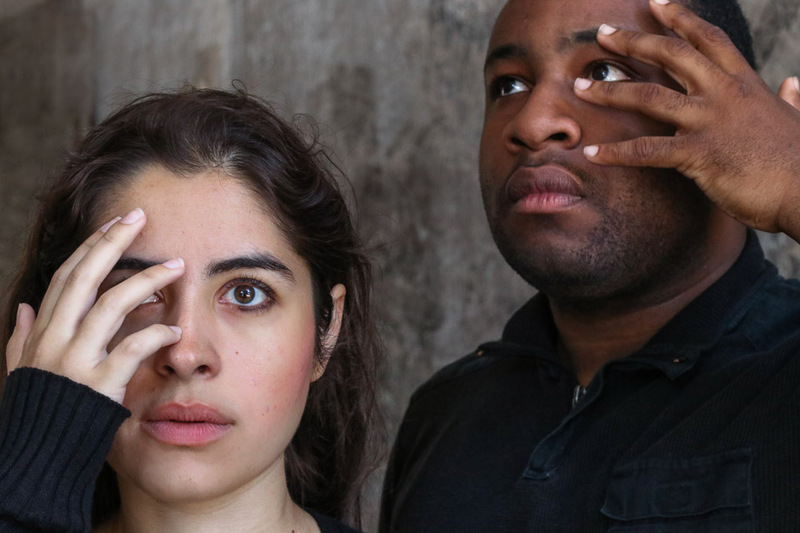 Highlights: This powerful piece speaks to the epidemic of gun violence by focusing on the stories of three young people, all tangentially connected. One has mental health issues that were never properly treated, one lashes out after being bullied for years and then raped, and one feels belittled by parents and excluded by former friends. 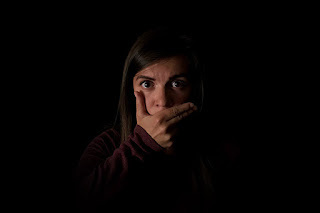 The cast (Calli Kunz, Callie Schroer, Riley McNutt, and Tim Beeckman Davis) is fully committed to telling this difficult story, with portrayals that engender empathy for these young people who did horrible things. The three stories are told in pieces mixed together, but it's never unclear where we are in the narrative thanks to the lighting, sound, and movement of the cast. Beautifully done, painful to watch, and an important story to tell to spark thought and conversations about an increasingly frightening issue. Fringe Festival 2017: "Pope Joan"
Summary: The story of the legend of a female pope (Pope Joan) re-imagined as a transgender pope (Pope John). Highlights: I love history, and the history of religions is particularly fascinating (and sometimes scary) to me. I don't think I've ever heard of Pope Joan (or John) so this show was enlightening. Playwright Christy Marie Kent has the characters speak in modern language, making the story feel current. We follow John (Kjer Whiting) as he decides to dress as a man, not just because he wants to be a monk* but because that's who he authentically is. 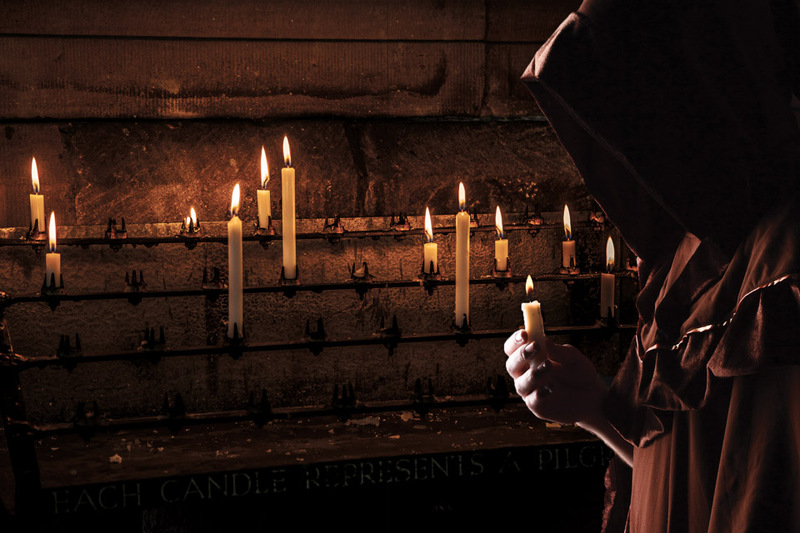 His secret is discovered by fellow monk Einhart (Jen Arzayus), who becomes a friend and confident as John rises through the ranks because of his dedication and scholarliness. When a rival to the papacy finds out, however, he is not so understanding, leading to what eventually is Pope John's downfall. This is a fascinating, thought-provoking show that explores history, gender identity, and the role of women in the Church (including the removal of the feminine divine from Christianity, Sophia the goddess of Wisdom). *Kind of like that episode of Northern Exposure where Chris lives in a monastery and finds himself attracted to a silent monk, who turns out to be a woman. Except not like that at all. Fringe Festival 2017: "A Mermaid Abroad & A Fish Out of Water"
Summary: A series of travel stories, from funny to profound and everything in between. Highlights: This show is like listening to your friends tell travel stories, if your friends were good storytellers with great life experiences to pull from. 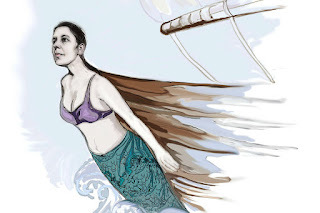 The storytellers are Ariel Leaf, best known for her Mermaid show (which I sadly have never seen), and Scot Moore, who shared his beautifully tragic (or tragically beautiful) travel story in last year's Break Your Heart (one of my faves of the 2016 Fringe). They take turns telling stories and interacting in a conversational, natural way. We hear about Ariel's travel fling gone wrong, Scot's one perfect night of connection, Ariel's struggle with finding a place to pee (my greatest travel fear), Scot getting high in a shopping mall in Canada, and that glorious feeling of returning home. I could have listened to Ariel and Scot tell their travel stories for another hour or two. And now I want to plan my next trip and have a few adventures of my own. Fringe Festival 2017: "Repertoire Dogs"
Summary: Impressions of celebrities in unlikely situations, performed by a cast of seven. Highlights: This show is just plain fun. Who doesn't love impressions? If they're good it's fun to appreciate the skill, if they're bad it's fun to laugh at how bad they are (and there's a bit of both in this show). Josh Carson hosts a panel which, when I saw the show, included Allison Witham, Ben Tallen, Brad Erickson, Kelsey Cramer, Ryan Nelson, and Thomas Matthes. The first segment is celebrities or fictional characters in movies they weren't in, like Tim Gunn reading the rules from Fight Club, Gollum in The Goonies, and George Bush doing the Independance Day speech. There's a bit of audience participation when someone picks a card of a stock impression every impressionist should have (Jerry Seinfeld) and a competition ensues to see who does it best, while reading from Fifty Shades of Grey. And one (un)lucky audience member gets to go onstage and try to guess the impression. After a lot of laughter (including from the stage, it's also fun to watch the panelists crack each other and Josh up) and Simpsons characters, the show wraps up with a motley crew singing "Piano Man." 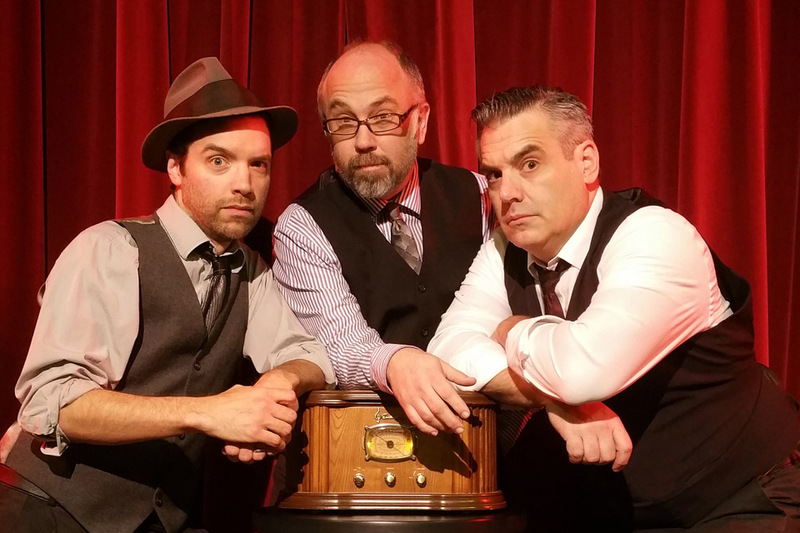 Fringe Festival 2017: "The Mysterious Old Radio Listening Society"
Summary: A reenactment of two radio broadcasts from the '40s and '50s, complete with commercials and sound effects. Highlights: Pairing a 1952 episode of Hall of Fantasy with a 1943 episode of The Shadow, this show is an entertaining and creepy homage to an era gone by, that of the radio drama. The creators of this show have a podcast of the same name (you can find it here, along with future live performances), and their love for and knowledge of the genre is evident. I closed my eyes a few times during the show, not just because I'm super sleep deprived after ten days of Fringing, but also because it's almost more chilling and thrilling to just listen and let your imagination create the picture of what's happening. And what's happening in these two programs is a lot of mysterious creatures and mad scientists and smart sleuths and the like. But it's also fun to watch the performers (see creator list above, plus Marc Doty filling in for Joe Weissman on keyboard when I saw the show), who all have such great retro radio voices (and smart retro wardrobe to match) with inventive sound effect implements. There's a reason these radio horror shows were so popular, and happily they continue to exist in some form today thanks to Goulish Delights. Summary: A rumination on the intersection of race and faith using movement, music, and dialogue. Highlights: STRANGER is a beautiful, truthful, quiet, thoughtful show that really brings the audience into the unique experience of being a Jewish person of color. The three actors (Fernanda Badeo, Gabrielle Dominique, Ricardo Beaird) are all beautifully honest in their portrayal as they tell the varied stories of Jews of color (collected from extensive interviews). One of the best things that theater can do is provide a place for different voices to be heard, and this is a voice and a story I haven't heard much. Movement (designed by Emily Madigan) and sound (designed by Izzy Burger Welsh) are thoughtfully used to help tell the stories, which include a Jewish woman from Brazil whose parents move to the U.S. in search of a better life, an African American man who chooses to become Jewish, and a little black girl who's teased by the other kids for observing Passover instead of eating Easter candy. Much attention to detail is paid in the storytelling and the result is a poignant, moving, cohesive show in which people are allowed to give voice their own experiences. 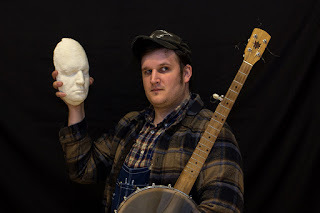 Fringe Festival 2017: "There Ain't No More"
Summary: "A one-man folk operetta" in which Willi Carlisle tells a story of folk songs by singing folk songs. Highlights: As I left the Crane Theater at 11 pm last night after snagging the very last token to There Ain't No More I thought to myself, "I don't know what the hell that was, but it was somethin' all right. It sure was somethin'!" Willi Carlisle (who's been gathering acclaim for his show at Fringe Festivals across the country) gives a tour de force performance. He starts the show as an old man dying of heart failure, telling the story of his life. He's so believable that I was shocked at how young he was when he removed the mask. I'm at a loss for words to describe this show; it's a crazy brilliant ride across decades and countries, accompanied by folk songs which Willi sings and plays on five different instruments (guitar, banjo, fiddle, harmonica, and some sort of small accordion), and scenes displayed on a scroll that Willi turns himself. Even though I wasn't quite sure when he was the old man (who talks about a girl he loved and lost, and his time serving and playing for the troops in Vietnam), or when he was a narrator, or when he was a song collector, I was happy to go on the ride wherever he led me. A mix of history, folk music (my favorite genre), commentary on war, death, life, love... this show is unlike anything else you'll get at the Fringe and definitely something to see. 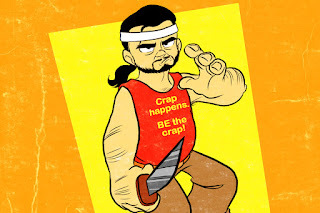 Summary: The creator of a series of videos and books about self-defense, Ted "Critter" Montana, is put on trial for inciting violence among his fans and followers. 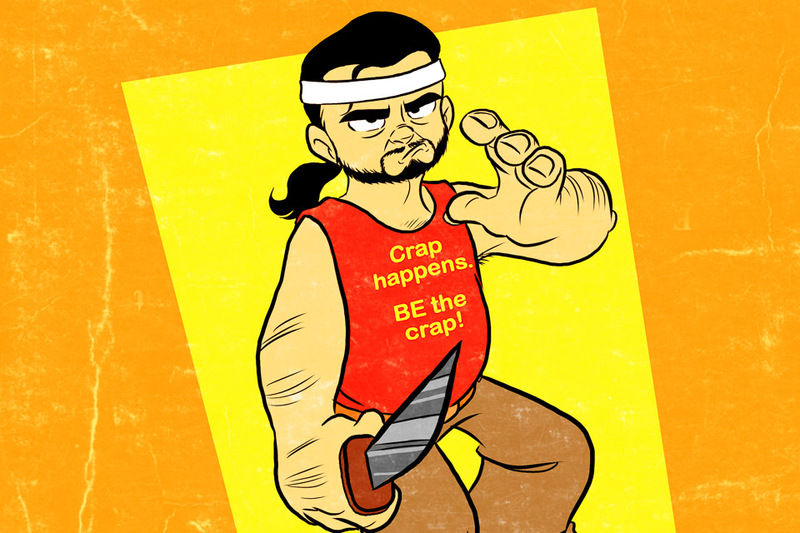 Highlights: This wacky and funny show switches back and forth between the Critter videos, in which he instructs on the six rules of a proper knife fight, and the trial. The assistant district attorney (played by a rotating series of guest actors, Michael Terrell Brown the night I saw the show) questions Critter about his videos, life, and philosophy. Which in the end seems to be commenting on the "stand your ground" law. But the video excerpts are the highlight of the show; this is my first time seeing a J. Merrill Motz show and he's very consistent and detailed in his portrayal of the crazy ball of energy that is Critter. I particularly enjoyed the long lists of various knife grips or stances, and his repetitive redundancy (which elicited such laughter from the crowd that the show used up every last second of the 60 minutes of allotted time). 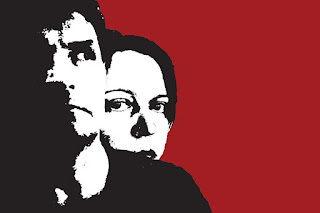 Summary: A two-person 60-minute adaptation of Shakespeare's tragedy Macbeth. Highlights: Wife and husband team April and Robert Hubbard tell the story of the power hungry Macbeths in under an hour, playing all of the characters. 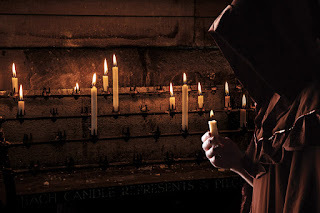 Dressed in black and with few adornments to signify character (crowns, a scarf for the sisters), the projected display of scene and characters is helpful, even necessary, to follow the story. Both members of the couple give great performances in many different roles - April is creepy in three different ways as the sisters, Robert is a scarily ambitious Macbeth, and everything in between. If you're a Shakespeare lover, check out this concise adaptation that retains the most famous lines like "fair is foul, and foul is fair," "tomorrow, and tomorrow, and tomorrow." 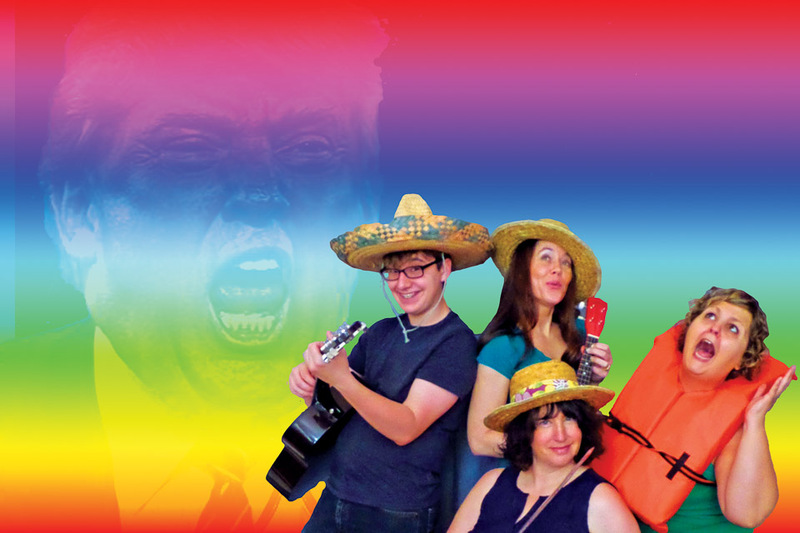 Fringe Festival 2017: "The End of the World Sing-Along Hour"
Summary: A sing-along radio broadcast from the radio home of the resistance is interrupted by an asteroid approaching earth. Highlights: If the world is ending, we might as well sing! 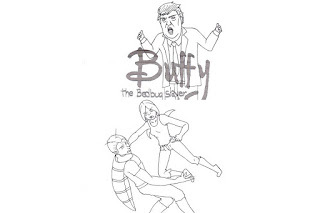 A wonderful premise, but I wanted more from this show. Literally, it was only about 40 minutes long (nothing throws a wrench in my tightly scheduled Fringe life like having 45 minutes between shows). But the cast (Carole Finneran, Eryn Tvete, Jennifer Eckes, Kevin Werner Hohlstein, and playwright Tracey Fletcher Zavadil) and live onstage band are fabulous, and singing songs like "This Land is Your Land" and the originals "Everybody" and "Never Give Up" (written by Tracey) truly does make one feel better about the world. In this show-within-a-show, when news breaks of an asteroid about to hit greater Minnesota (the cabin! ), the sing-along cast decides to try to thwart it with song waves - simultaneous singing and kazooing across the country. A cute and fun show, I just wish there were more singing (and less politics)! Fringe Festival 2017: "The Zoo Story (New Version)"
Summary: In 1960s NYC, a "transient who lives in the rooming houses on the Upper West Side" approaches a middle class family man reading on a bench in Central Park. Highlights: Wikipedia tells me that Edward Albee's 1958 one-act play (his first) "explores themes of isolation, loneliness, miscommunication as anathematization, social disparity and dehumanization in a commercial world." Does it ever! 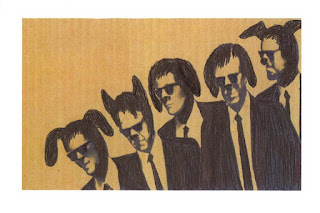 What starts out as an amusing conversation between the frantic Jerry and the reserved Peter turns into something a bit more intense as Jerry describes an existential encounter with a dog that gets at the very nature of life, death, and love. The wordy script is thought-provoking, and Sam Ahren gives a remarkable performance as Jerry, physically transforming into this crazy (or perfectly sane and brilliant) man with almost scary reality. Brad Erickson is also fantastic in a more subtle performance as Peter, who may not be as together as he seems. Directed by Pat O'Brien (who stars in that other tragic two-men-sitting-on-a-park-bench show, Whisper Into My Good Ear), The Zoo Story is one well worth listening, and one that will leave you pondering the weighty themes for some time to come. Fringe Festival 2017: "RomCom-Con: A Meet-Cute Musical"
Summary: After bad break ups, two people meet-cute at a convention for fans of romantic comedies. Highlights: This meet-cute musical is super cute. 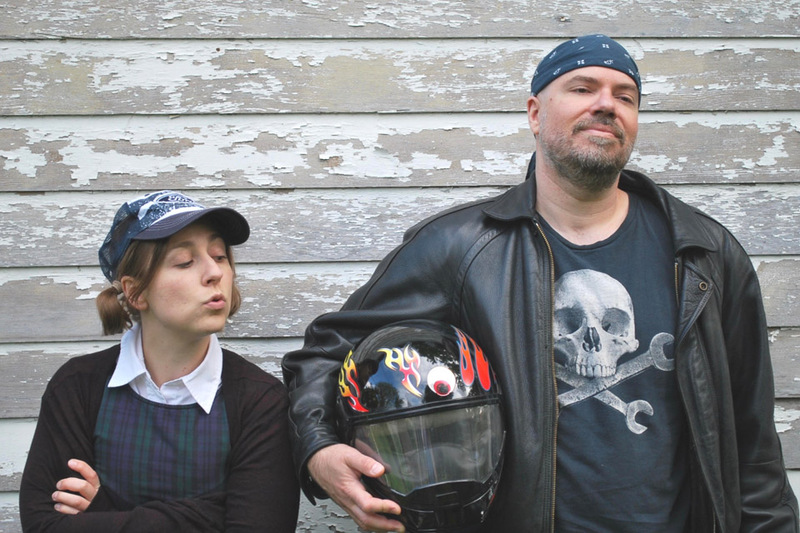 Book writers Nathan Kelly and Kerri O'Halloran have filled the show with rom com references old and new. The show pays homage to the genre that is loved by so many, including our meet-cute couple Will (Aaron Cook) and Samantha (Erin Kennedy), while turning some of the tired tropes on their head. When Will jumps in to defend Sam to her ex Brock (Edd Jones), who comes to the rom com dressed as his favorite rom com character Severus Snape, she protests that they've only just met and she doesn't need him to defend her. And then goes on to explain that true love doesn't happen in an instant, but builds with time and hard work. 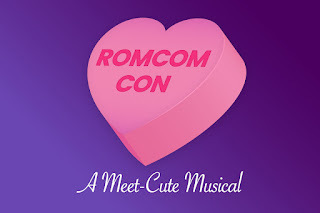 The super charming and appealing cast also includes Hannah Parish as a rom com guru/fairy godmother, and Nimene Sierra Wureh and Drew Tenenbaum as the best friends who have a meet-cute of their own, even though we're told "true love is for main characters only." Kyle DeGoey (music and lyrics) has once again written a clever, fun, and genre-specific Fringe musical (see also Oregon Trail and Gilligan). Fringe Festival: "Hello, I Must Be Going..."
Summary: The true life story of Groucho Marx and the controversy around his late in life companion/secretary/manager Erin Fleming. Highlights: When looking around for shows to fill the hole in my schedule last night, I saw "Ari Hoptman as Groucho Marx" and needed to look no further. Ari is impeccable as Groucho, portraying both his wry humor and his failing health in this fascinating story. He even does a bit of charming improv chatting with the crowd. Playwright Garrett Rademacher has constructed the play as a flashback of an older Erin (Deborah Frethem), who ended up homeless and (spoiler alert) shot herself in 2003, 26 years after Groucho's death. 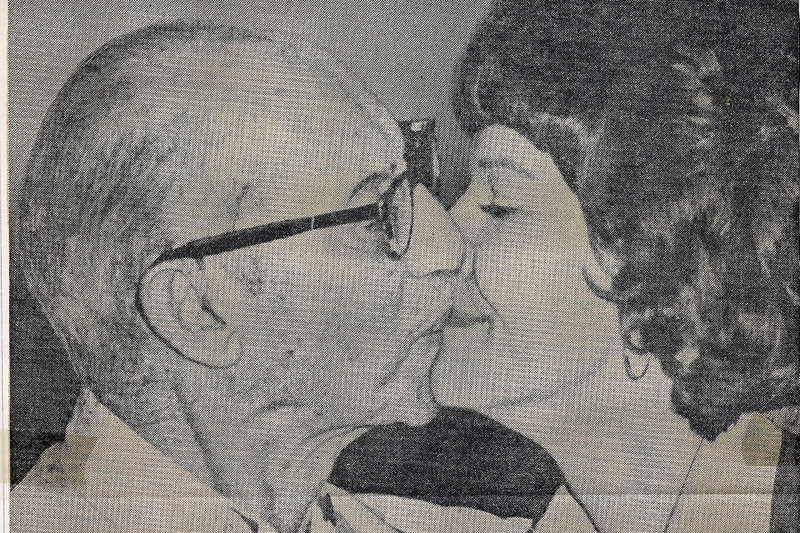 She expresses regret and nostalgia about her time with Groucho in the '70s, and then we see their relationship play out briefly. The younger Erin (Colleen Thul, who really looks like a younger version of Deborah) starts out helping Groucho with his life and career, including bringing about an honorary Oscar, but ends up verbally and physically abusing him. I would love to see this play expanded and fleshed out, with more time spent on how the relationship went from good to bad. But even as is, it's a fascinating look at an intriguing real life relationship. But you really don't need to know any more than "Ari Hoptman as Groucho Marx." 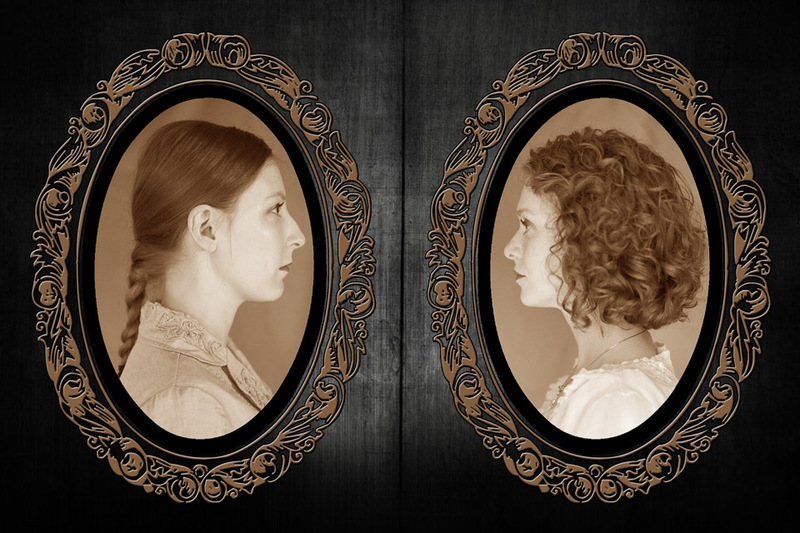 Fringe Festival 2017: "The Memory Box of the Sisters Fox"
Summary: The Fox sisters, founders of Spiritualism, tell their story. Highlights: This is a haunting and beautiful show, the cause of my first tears actually shed at the 2017 Minnesota Fringe Festival (it's not Fringe without at least a few tears). The Arena space is set up like a seance circle of empty frames and candles, and with overflow seating (this show is selling out so reserve in advance), people were seated on the floor just outside the circle so it really felt like we were conjuring something together. Maggie and Katy Fox (Boo Segersin and Kayla Dvorak Feld playing the charming and precocious younger versions, Kristina Fjellman and Megan Campbell Lagas playing the older and sadder versions) are directed to tell their story, even the painful parts. They walk us through the joy and pain of their careers as mediums, from their initial discovery, to scientific evaluations by doubters, to eventually confessing to fraud. This is a very thoughtful, detailed piece down to the period clothing in stark white and black and the charming but creepy soundtrack created by a number of instruments and noisemakers. The wonderful and believable cast (also including director Amber Bork) sings some gorgeous harmonies on traditional songs like "In the Gloaming" (responsible for the aforementioned tears). In the world of the play, the sisters truly believed in what they were doing, and confessed only because they were forced to. Who knows what the truth is, but it's comforting to believe that those we love are still with us even after death. Regardless of what you (or they) believe, this is a mystical, magical hour of theater, storytelling, and music. 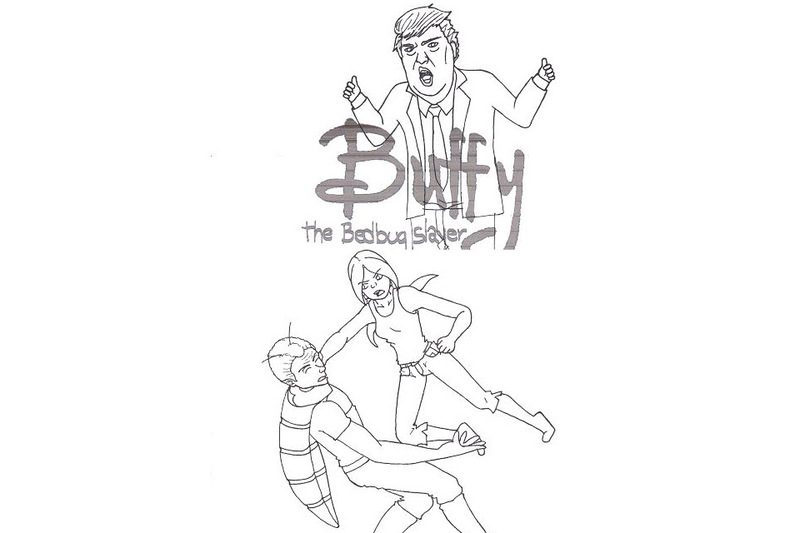 Fringe Festival 2017: "Buffy the Bedbug Slayer"
Summary: Retired from vampire slaying, Buffy must face an even tougher foe - bedbugs and an evil landlord namded Drumpf. 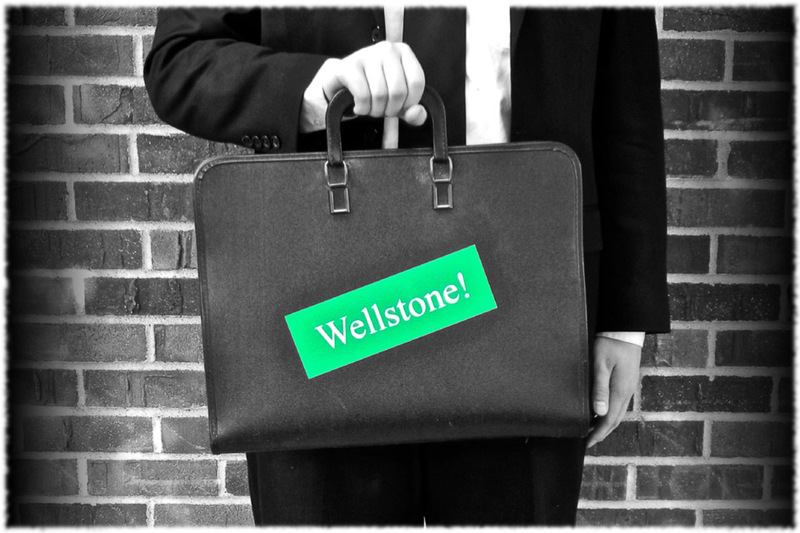 Fringe Festival 2017: "Wellstone: A Minnesotan Musical"
Summary: A musical about the life and work of Minnesota senator Paul Wellstone. Highlights: A lot of Fringe shows are outrageous and over the top, so it's always a welcome respite to find a show that's sweet and sincere, like this one is. This is a beautiful portrait of a Minnesota hero, a politician who believed that politics was not about money or power games (what a concept), who fought for and enacted change in campaign finance and mental health care. Of course, anytime you try to shove 40 years of a person's life into an hour it's going to feel a little fast and disjointed, more of a surface overview than a deep dive, and this does. And the five songs come a little out of the blue as the rest of the piece feels like a straight play; a few more songs and perhaps some musical underscoring might make it feel like more of a musical. 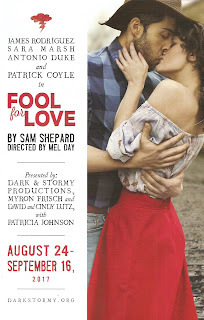 But the ideals and the heart of the story are there, and the cast (Cayla Marie Wolpers, Christof Krumenacker, Jason Millsap, Rachel Lawhead, and especially Michael Turner as Wellstone) is beautifully earnest in their portrayals (if a bit too young for the older, wiser versions of the characters). As the cast recounted some of the major political happenings since Wellstone's death in a plane crash in 2002 at the end of the show, I had tears in my eyes at the thought of politicians who actually cared about their constituents and making the world a better place. 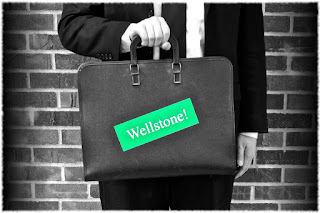 Would we still be where we are if Wellstone had lived and served another six (or more) years in the senate? No one can say, but this show made me feel simultaneously depressed at the current state of politics and hopeful that the Wellstones of the world will eventually prevail. 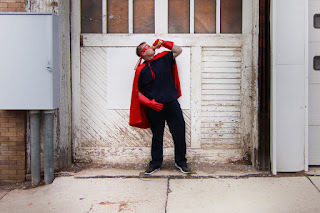 Fringe Festival 2017: "Subpar Heroes"
Summary: A small town donut factory and its employees are forever changed when an evil woman buys it and fires them, and then a comet passes overhead, giving everyone sort of special powers. Highlights: It's super fun to see my favorite Duluth theater peeps in Minneapolis in this super fun show! It's pretty standard fringe fare, but performed with flair by the terrific cast. Shortly after our gang (Andy Frye, Angie Martin, Carolyn Trapskin, Katy Helbacka, Zachary Stofer) is laid off from the donut factory, a comet passes over giving them all superpowers that are less than super, like levitating small objects, or seeing two seconds into the future, or making people sing and dance (which is actually a pretty awesome superpower). At the same time, the new owner of the factory (a gleefully maniacal Mary Fox) also gains a superpower, and for some reason decides to sprinkle ecstasy into the donut batter, making the town go crazy. The subpar heroes plot and plan to pool their limited resources to overthrow her, but can't quite make it happen. Still, they can sing about it (with delightfully fun original music by Andy Frye). Next time you're in Duluth visit Renegade Theater (they're doing the rarely produced Pasek and Paul musical Dogfight right now! ), and listen to the Take It With You (live radio theater from Duluth!) to hear more silliness and music like this. Fringe Festival 2017: "The Wright Stuff, or You'll Believe They Can Fly!" Title: The Wright Stuff, or You'll Believe They Can Fly! Summary: A comic and very fictionalized version of the true story of Orville and Wilber Wright who built and flew the world's first airplane. Highlights: This show is a whole lotta fringey fun. Josh Carson and Andy Kraft are the odd couple brothers, the serious and ambitious Orville and the dimwitted and accident prone Wilbur. Sulia Altenberg is their no nonsense sister who longs to go to college and, you know, vote. Jim Robinson is their widowed Bishop father, just trying to hold the family together. 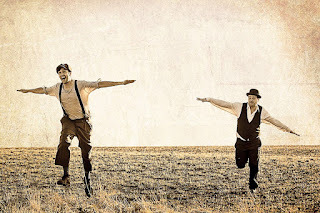 We witness their first attempts at flight, during which Josh and Andy throw their bodies around the theater with abandon and no regard to their own safety, which is great fun for the audience. This cast is fantastic and hilarious (also including Mike Fotis and Tucker Garborg). 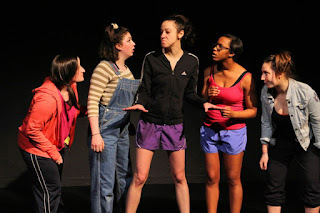 But perhaps the best part of the show is the Greek chorus singing pop songs (Karissa Lade, Leslie Vincent, and Olivia Hedeman), the songs perfectly chosen (the most obvious being "I Believe I Can Fly"). Summary: The story of a community synchronized swimming team in the early '90s marred by all the drama of being a teenage girl. Highlights: This super cute show full of '90s references (Blossom, Joey Lawrence, Rainbow Brite) builds to the even cuter synchronized swimming routine. The girls in a summer team go to their first big meet, and inter-personal drama threatens to get in the way. The seven-person cast (Constance Brevell, Danielle Krivinchuk, Michelle Casali, Sarah Parker, Starla Larson, Sulia Altenberg, and director Rebekah Rentzel filling in when I saw the show) are all pretty adorable tween girls with all their drama and seriousness and note-writing and glee. In fact it's such an accurate (if exaggerated) depiction of that difficult age I almost felt sick to my stomach remembering the trauma! The costumes (designed by Sulia) are spot on with the stone-washed jeans and array of swimming suits, as is the styling, complete with side ponies. And seriously, that routine is the best! We're halfway through the 11-day, 15-venue, 167-show Minnesota Fringe Festival. I've seen 25 shows, with another 20-some on the schedule for the next five days. Here are a few of my favorites so far. I haven't seen everything on my must-see list yet, so be sure to check that out for more recommendations. And you can read all of my Fringe mini-reviews here. There are five days left of Fringe - so get out there and see some shows! Full schedule, venue, and ticketing information can be found on the Fringe's handy dandy website. 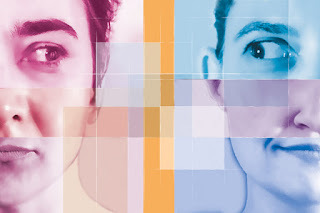 Fringe Festival 2017: "Much Ado About Nothing (as told by Dogberry and Verges)"
Summary: A funny and clever and very meta adaptation of Shakespeare's Much Ado About Nothing featuring an all female cast and creative team. Highlights: Catherine Johnson Justice adapted and Sarah Agnew directs this perfectly delightful Shakespeare adaptation that starts with a couple of stagehands (Taj Ruler and Sara Richardson) wondering what to do when the actors don't show up. This is one show you'll want to show up early for as the comedy starts before the pre-show announcement. 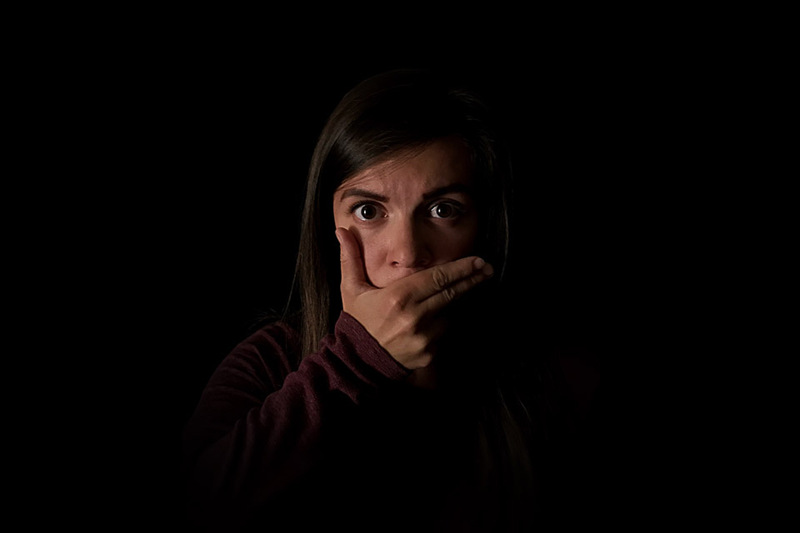 The stagehands soon take things into their own hands and tell the story on their own, with the help of actors Alayne Hopkins, Catherine Johnson Justice, Elise Langer, and Kirby Bennett, and a couple of puppets. The star-crossed love stories of Hero and Claudio, and Beatrice and Benedick, are clear and concise in the less than an hour time limit, while the occasional breaks out of the play within a play add interest and fun to the proceedings, and this cast is full of comedians with perfect timing and hilarious comic choices. After seeing this and the lovely Twelfth Night adaptation What You Will, I'm beginning to think Shakespeare should always be 60 minutes long. Fringe Festival 2017: "Crash and Burn: An American Success Story"
Summary: An original story about an Evel Knievel-like daredevil who returns home to the trailer park where he grew up. Highlights: I love the narration and musical soundtrack provided by Tiny Gene Poole on steel guitar, it makes everything more melancholy and tragic. For this is a tragic story, despite the ironic title. Johnny Meteor (Trevor Keeth) has had some success in the daredevil jumping-over-things-on-a-motorcycle world, but after one too many crashes and burns, and the death of his mother, he decides to spend some time in the trailer park. He runs into old friend Ruth (Lauren Diesch) and her daughter Grace (Megan Rene Guidry), who wants to leave her books behind and enter the world of jumping, against her mother's wishes. Despite the plot twist obvious to anyone who's ever seen a soap opera and an inevitable conclusion, the show is worthwhile because of the winning and natural performances by the cast (particularly Lauren Diesch's impressive dual roles) and that plaintive steel guitar. 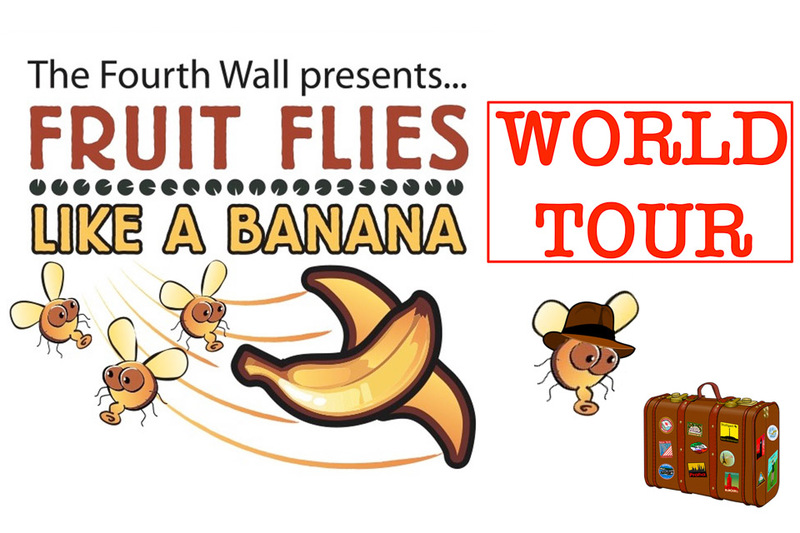 Fringe Festival 2017: "Fruit Flies Like a Banana: WORLD TOUR"
Summary: Three classically trained musicians perform short pieces of classical music combined with unique movement, dance, and acrobatics. Highlights: The Fourth Wall Ensemble, aka C. Neil Parsons (trombone), Greg Jukes (vibraphone and other percussion), and Hilary Abigana (flute), is back at the Minnesota Fringe Festival for the third year in a row. Every year it's the same basic premise - a series of short songs performed with inventive movement. This year the performances are structured around a "world tour" theme, with 14 pieces inspired by various places around the world or written by residents of these places. This trio is so creative (and they use the in-the-round space really well), I have literally never seen anyone do what they do, and that alone is reason to see them and why we need fringe festivals. But it's also an extremely fun and entertaining show that flies by (proving their theme - "time flies like an arrow, fruit flies like a banana"), while also educating and exposing the audience to various composers and music styles past and present. The pieces are arranged in random order chosen by the audience, and the Antarctica piece was the perfect finale when I saw the show; it's truly beautiful and haunting with some awesome movement on curved boat-like structures. Indescribable. I played the clarinet in high school and let's face it - the band kids are the nerds in the strict social structure that is high school. But these cats make playing instruments cool. My favorite fringe moments are those "how do they even think of doing that?!" kind of moments, and this show is chock full of them. 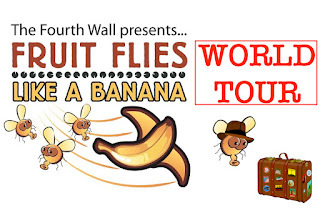 Whether you've never seen Fruit Flies Like a Banana, or seen it dozens of times, this show is always a must see! Fringe Festival 2017: "Never Wonder Land"
Highlights: To be honest, I wanted to like this show more than I did. It's a great concept - what happens when Wendy meets Alice? But the story lacks momentum and moved a little too slowly for me. Still, dancers Tamara Koltes and Kit Shelton are both lovely and childlike as they wander through this mix of Neverland and Wonderland, and Michael Terrell Brown is charming as he portrays multiple characters from the Cheshire Cat to the Mad Hatter. Fringe Festival 2017: "A FUNKiN' Good Time"
Summary: A showcase of Funksyle dancing. Highlights: Where else am I going to see Funkstyle dancing besides the Minnesota Fringe Festival?! I don't even know what Funkstyle dancing is, but now I kinda love it! Apparently it involves something called popping, and locking, and waacking. Plus some pretty impressive break-dancing. 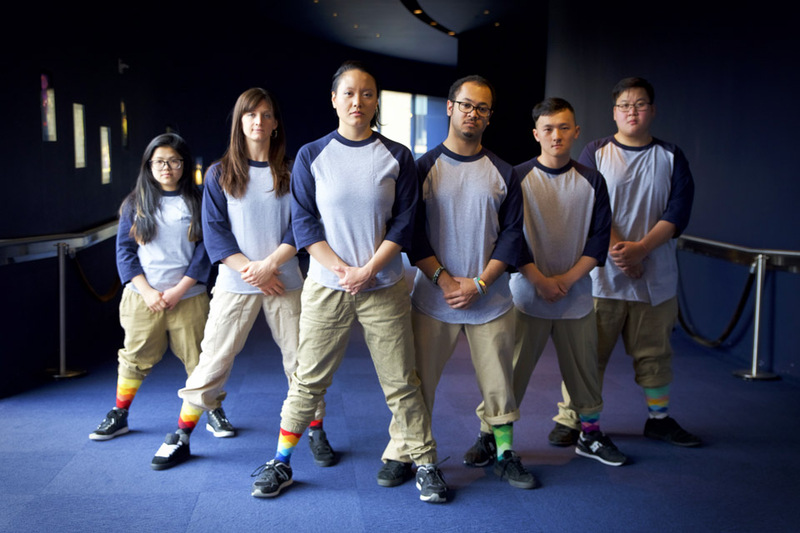 The seven-person ensemble (including choreographer Tracy "Ti-en-T" Yang and her troupe Adam Myhand, Annie Aldag, Lisa Berman, MalvinX Jay Vue, Melvina Cha, Meng Lor) can really move, in ways I didn't know the human body could move. But more importantly, they perform with such joy that it's infectious. It's impossible to watch them and not have a funkin' good time. Truthfully, I only saw this show because I had a hole in my schedule and it was there, but I'm so glad I did. Fringe Festival 2017: "Whisper Into My Good Ear"
Summary: Two old bums sitting on a park bench talking about life and death. Highlights: This is a sweet and sad story of friendship and talking stock of one's life. 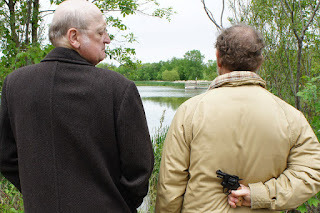 Lawrence Ripp and Patrick O'Brien are Charlie and Max, two friends with not much to live for. They're a bit like the Odd Couple. Charlie is gregarious and fairly satisfied with life, despite the fact that he's going blind and his wife doesn't know who he is anymore. Max is reserved and prone to making profound and obscure statements. He's alone in life, and ready to be done with the whole thing. The two men sit on a park bench and talk for an hour, which isn't as boring as it sounds, rather it's sweet and sad and poignant. Lawrence and Patrick (who also directs) both give thoughtful, lived in performances that make you empathize with both men. 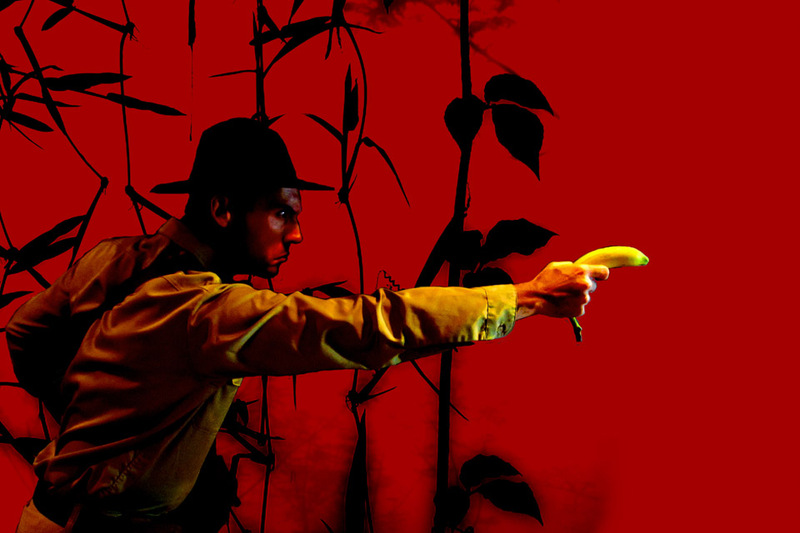 Fringe Festival 2017: "The Banana Wars"
Summary: A history lesson about the world's most popular fruit, the banana, and the wars that the US fought in the Caribbean because of it. Highlights: This show is the reason the Fringe Festival exists. Most shows - dance, sketch comedy, drama, musicals, even clowning - have another performance home. But where else can someone give an hour-long history lesson about the banana that manages to also comment on the US military through history to today? What Derek Lee Miller has done here is, simply put, brilliant. It's like if John Oliver were to do a piece on the so-called Banana Wars, and at the beginning you think, "why is he talking about the Banana Wars?" And at the end you think, "OMG why isn't everyone talking about the Banana Wars?! Smedley Butler, people, Smedley Butler!!" Using a series of silent film placards, Derek walks us through these small, brutal wars (which I won't even begin to explain here, just go see the show), interspersed with personal remembrances, all to paint an ugly picture of greed and power. Smedley Butler, by the way, that guy with the funny name you've never heard of, was the most decorated Marine in history who at the end of his life spoke out against the US military. Like a speeding freight train, Derek barrels through history at a breakneck head-spinning fast-talking pace that makes 60 minutes feel like 10. This show probably won't make you feel good about the world or about being an American, but like a good John Oliver piece, it'll make you glad you know about the Banana Wars. And you'll never look at a banana the same way again. Fringe Festival 2017: "Sevlin & Devlin Presents: Seven Evans in Heaven"
Summary: A delightfully silly tale about two sisters named Evan who die, one going to heaven and one going to unheaven. Highlights: On paper the story doesn't sound like much - two happy and close sisters die one day, one ending up in heaven and one in hell, and the one in heaven has to go get the one from hell and bring her back. Where does that even come from?! But when brought to life by the Ferrari McSpeedy gang (Anna Hickey, Erin Sheppard, Joe Bozic, John Gebratatose, Mike Fotis, Rita Boersma, Ryan Lear, and director Jason Ballweber), it's pure delight. A bunch of silly gags, fake fights with invisible weapons, cute little songs (with Ryan on ukulele), and puppets are just some of the fun elements that fill out the tale. It almost feels like some of the show is improvised but it's hard to tell, and some of the most fun moments are when the cast crack each other up. Last night's show sold out the tiny Ritz Studio space, so you'll want to make reservations in advance to see this expert exercise in comedy. Fringe Festival 2017: "One Foot"
Summary: A lovely and bittersweet romance marred with tragedy, but one that finds happiness nonetheless. 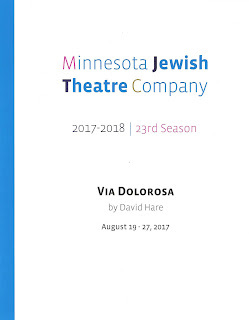 Highlights: While the Fringe website describes this play as "pure Minnesotan," it felt pure Irish to me, and not just because of the accents. 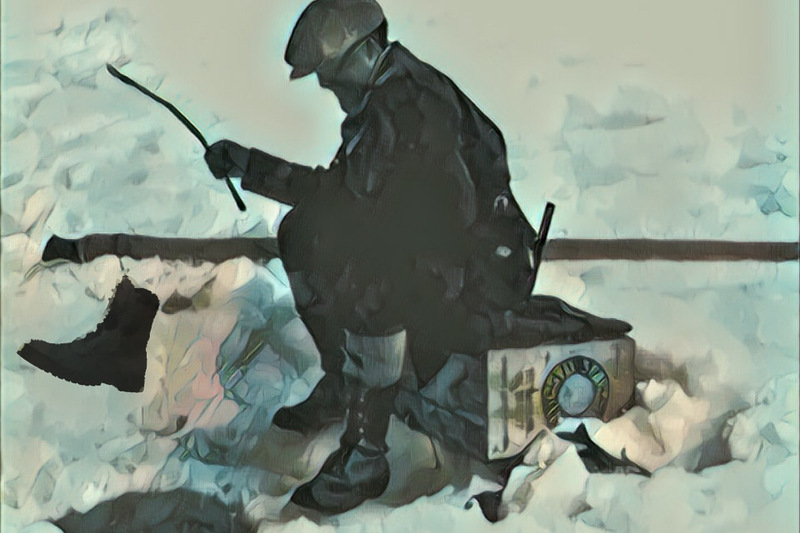 (Do people go ice fishing in Ireland? A quick google search tells me yes.) Andrew Erskine Wheeler and Jamie White Jachimiec both give wonderfully real performances as this charming Irish couple, you can feel the love and tenderness between them. Finn one day wakes up finding his foot has fallen off, and wife Dove doesn't seem too disturbed by it. We then flash back through their relationship from their first meeting on the ice, to their wedding, to the loss of their child. Beautifully staged by director Lanny Langston with inventive use of a sparkling white cloth to represent different things, beautiful performances by the actors, and that distinctly Irish mixture of sadness and joy all combined to leave me feeling all mushy. Fringe Festival 2017: "Melody Mendis is Barbra"
Fringe Festival 2017: "Code: L-O-V-E"
Fringe Festival 2017: "The Buttslasher"
Fringe Festival 2017: "Blackout Improv"
Fringe Festival 2017: "What You Will"
Fringe Festival 2017: "Fainting Room"
Fringe Festival 2017: "On the Exhale"
Fringe Festival 2017: "ODD MAN OUT"
Fringe Festival 2017: "It Can't Happen Here"